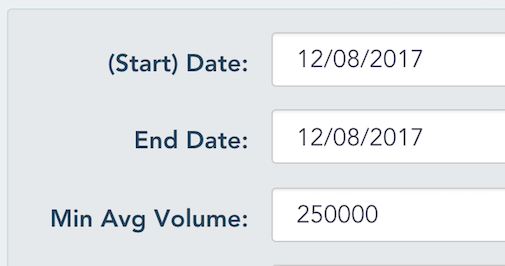 Scanning for a given pattern / signal over a range of dates is a feature I've wanted for a long time. A nice side-effect of the recent change I made to the way things are stored in the site's database is that it's now much easier for me to build that capability. Over the last couple of weeks I received a few requests for adding a date range to the scans. So starting today paid subscribers will be able to run scans across a date range. You'll see that there's now an end date as part of the search / filter criteria. The way this works is that the sytem will find stocks which have made the desired signal on ANY SINGLE DAY within the entered date range. So, for example, if you were looking for stocks which found support at their 50-day moving average over the previous week, it would show stocks that bounced off the 50-day moving average on the previous Monday OR Tuesday OR Wednesday OR Thurday OR Friday. P.S. To run scans for a single day at a time just make sure the end date is the same as the start date.